As regular readers will know, HRI has been investigating the sordid world of the Spanish cluster bomb industry. Now Spanish officials (not known for releasing specific information about arms exports) have reportedly claimed the cluster bombs found in Misrata, (type MAT-120 made by Instalaza) were never exported to the USA. However, they refuse to provide the actual evidence, documents, licenses, end-user certificates and so forth and are not letting anyone know where all the missing cluster bombs have actually gone. Where are these bombs, produced by Expal Explosivos, now? The Spanish government officials face something of a credibility deficit, after decades of hiding the truth from the public, so it is best not to give too much credence to what they say. Nevertheless, we have already explored some of the issues around Spanish bombs and new information sheds light on the claim that no cluster bombs were exported to the USA. 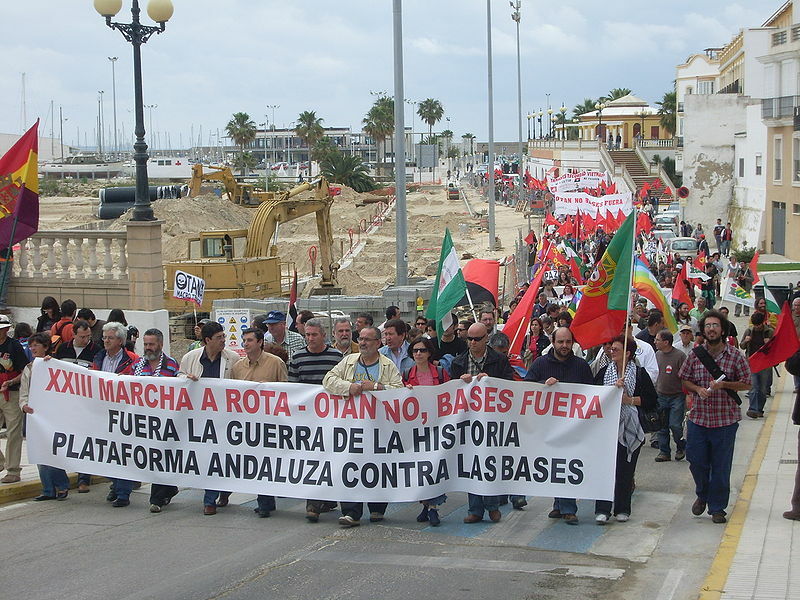 NATO no - Andalucia against the base! Naval Station Rota is an important supply base for the Americans, described by them as the “Gateway to the Mediterranean.” US Navy ships use Rota for all kinds of naval supplies, including bombs and ammunition. The Naval Station is the only base in the Mediterranean capable of supporting Amphibious Readiness Group post-deployment wash-downs. 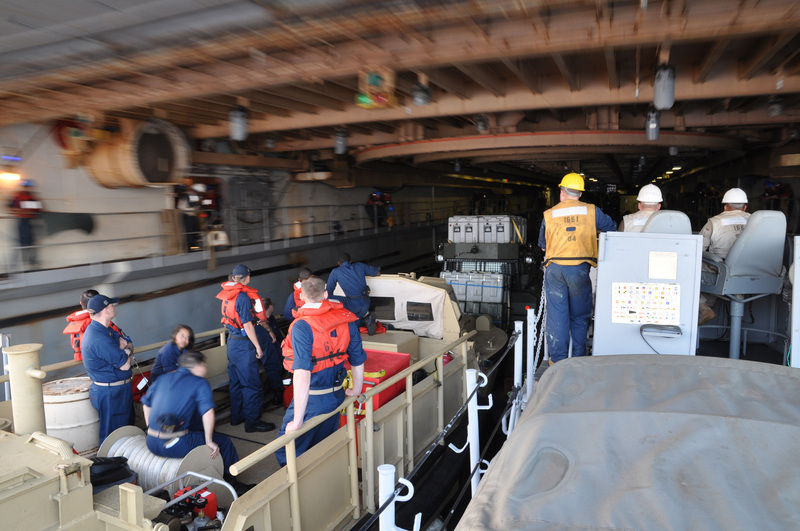 USS Ponce (pronounced pon-say) stopped off at Naval Station Rota, following her deployment off the coast of Libya, following the bombing of Misrata, following the sacking of her Captain Etta Jones and First Officer Kurt Boesnich and before making the trip back across the Atlantic. The US Navy is the tenant of a 21 sq km section of the 24 sq km base, but the base is used jointly by Spain and the United States. It remains under the Spanish flag and is commanded by a Vice-Admiral of the Spanish Armada. Until recently the commander of the US section of the base was a Captain William Mosk. NAVSTA Rota is technically a tenant of the Rota Spanish Armada base, although no rent is paid. So if Instalaza and Expal’s bombs were delivered to Rota, it seems quite possible that government officials would consider it within their rights to claim the weapons were never exported to the USA. So, was the use of cluster munitions in Misrata perhaps an operation with a dual purpose? To help win Misrata for the rebels, using weapons favoured by the US military, which could simultaneously be blamed on Libyan loyalist forces? It would be tempting for a coalition commander or psychological operations unit, particularly with a stockpile of suitable weapons so close at hand. We have already seen the importance that Admiral Stavridis places on the information war and governing the internet. On the other hand, is it possible that the Libyan army or rebels used these weapons? Or perhaps it was all just a mistake – with the shortage of ammunition perhaps these rounds, having lain in storage for years, were brought into action without any thought for the political consequences. Perhaps those immediately responsible were sacked in the aftermath, on various pretexts; but given a supine and pro-war media the powers that be decided they could get away with covering up the whole business up? Also we have seen a number of high profile sackings of US Navy officers a few days after the bombing of Misrata, including the captain and first officer of the USS Ponce on April 23rd. The commander of the U.S. Navy base in Rota, Spain, has been relieved of command after Navy leadership lost confidence in him to “effectively handle issues surrounding an ongoing investigation under his authority,” a Navy spokesman said Tuesday. Rear Adm. Tony Gaiani on Monday relieved Capt. William Mosk as skipper of Naval Station Rota, where he has been commander since June 2008, said Lt. Cmdr. David Benham, a spokesman for Navy Region Europe, Africa, Southwest Asia. Benham declined to provide any information about the ongoing investigation, being led by the Naval Criminal Investigative Service. The Human Rights Investigations (HRI) probe into the actual facts continues, notwithstanding the propaganda pumped out by governments and the media. Unlike others, who have jumped to conclusions on the basis of emotion, HRI continues to question, to discover more evidence and bring that to our readers attention so they can make up their own minds. Little is known about the secretive (and now largely outsourced) Spanish cluster bomb industry – until its products turn up in foreign lands. Spain has signed up to, but not yet implemented into domestic legislation, the Convention on Cluster Munitions. It is time Spain implemented the legislation and also provided full transparency about its past activities, in order to prevent further use of Spanish cluster bombs. 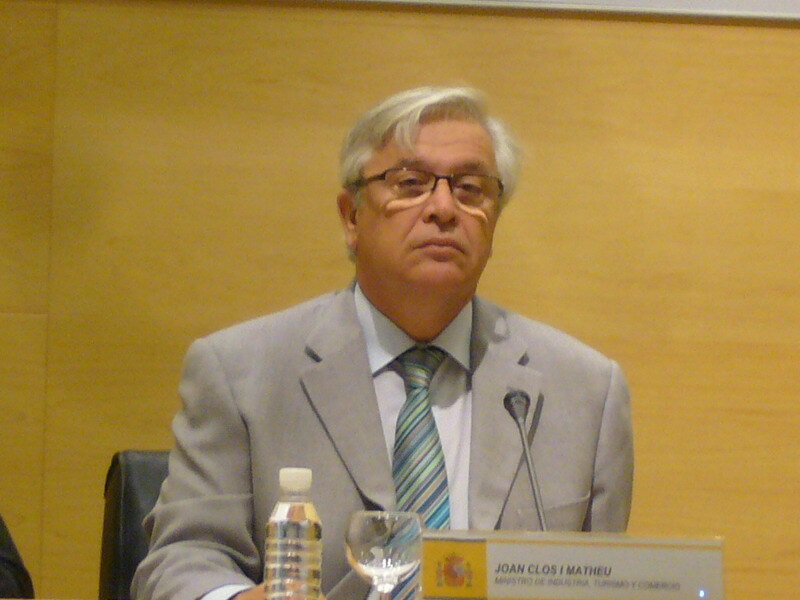 Snr Miguel Sebastian, the current industry minister, should make full disclosure as to where all the cluster munitions produced in Spain have gone. 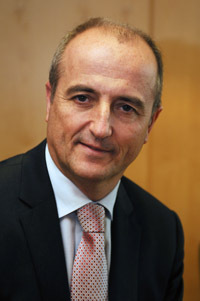 Miguel Sebastian, of course was, earlier in his career, Assistant Director-General of Banco Bilbao Vizcaya (BBV) and Banco Bilbao Vizcaya Argentaria(BBVA). BBVA has been singled out for criticism by human rights and citizens groups for its human rights record and for its links with the arms industry. BBVA was also criticised by Pax Christi for having no rules banning it from transactions linked to cluster bombs. 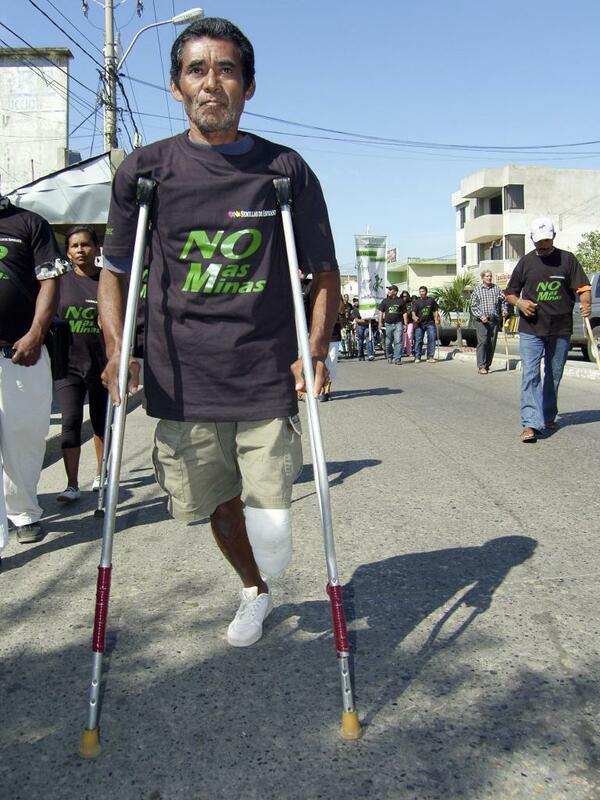 1) What happened to the machinery for making cluster bombs owned by Instalaza and Expal. Are companies in other countries now making variants of these Spanish bombs? Spanish media reports indicate that Instalaza have denied selling the MAT-120 weapons to Libya. When HRI contacted Instalaza, on a number of occasions, they were surprisingly reluctant to discuss their products. On top of that, munitions found in Misrata in April 2011, dated 2007 (batches 02/07 and 03/07) look remarkably similar to products from the Instalaza company. Regarding exports of cluster munions to Libya, the Spanish Export Statistics regarding Defence Material, Other Material and Dual-Use Items and Technologies, 2007 on page 51 in the table of Authorised exports of Defence Material by Country 2007 shows 3 licenses were issued by Spain to a value of 3,823,500 Euros. On page 53 in the table of Authorised Exports of Defence Material by Country and Article 2007 we see these exports are in category 4, which includes cluster bombs and missiles. In Spanish Export Statistics regarding Defence Material, Other Material and Dual-Use Items and Technologies, 2008 on page 56 in the table of Exports of Defence Material Completed, 2008 we see actual exports were made valued at 3,839,210 Euros. Firearms (including pieces of artillery), rifles, howitzers, cannons, mortars, anti-tank weapons, projectile launchers, flame throwers, recoilless rifles, signature reduction devices, military smoke, gas and pyrotechnic projectors or generators and weapons sights. Bombs, torpedoes, grenades, smoke canisters, rockets, mines, missiles, depth charges, demolition charges, “pyrotechnic” devices, cartridges and simulators, smoke grenades, incendiary bombs, missile rocket nozzles and re-entry vehicle nosetips. These categories, used in the Spanish Report, are in line with those of the Common Military List of the European Union. Reading the Spanish government reports there is absolutely no mention of supplying cluster munitions to Libya and close analysis of the text even suggests they couldn’t have – so why the cover-up? Alaveses Explosives, Inc. (EXPAL) is a dedicated solely to military equipment manufacturing sub-munitions and explosives. It produces all sorts of projectiles, fuses, shells and bombs. As Pere Ortega explains in his article on “The Living Death EXPAL” this company has exported arms to Israel (who infamously fired over a million cluster bomblets into Lebanon), Mauritania and Angola. EXPAL land mines infest the Western Sahara and Colombia and Saddam Hussein’s mustard gas bombs in the Iran-Iraq war were housed in EXPAL casings. The BME 330 AT (anti-tank) bomb is one of a family of three air-launched cluster bombs that was been developed by Expal for use by the Spanish Air Force and for export purposes. 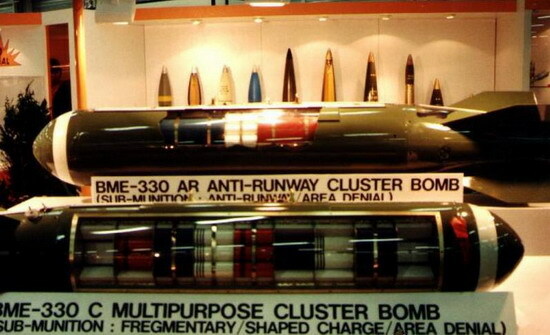 The other two were the BME 330 AR (anti-runway) bomb and the BME 330 C (multipurpose) bomb. It is unknown where these were sold. This picture shows Spanish made cluster bombs which are dropped from the air – where did these go? In June 2006, EXPAL appointed as president Francisco Torrente, a former admiral of the Spanish Navy, who only months before had held the post of Secretary General for Defence Policy. Following this move EXPAL contracts with the Ministry of Defense improved remarkably, winning several contracts, including one for the destruction of the 5 600 cluster bombs in possession of the Spanish armed forces, many of which it had produced itself. EXPAL is part of the EXPAL MaxamCorp, formerly Spanish Union of Explosives (UEE) which comprises six companies in Spain dedicated to the manufacture of all types of explosives. Maxam is a multinational with presence in many countries the current owners including Bank Santander. EXPAL has signed a partnership agreement with Brazilian explosive and arms company Imbel. In the story of EXPAL and Instalaza we see the familiar story of close links between the government, banks and the arms industry and the outsourcing of production to states with lower standards of regulation. *Update 3rd July 2011 based on the text of the letter of the Spanish Foreign Minister Annex II describing numbers and date of cluster bomb stockpiles on 2 December 2011.